What Is Credit and How Is It Used? Living without credit is difficult. Today's world demands good credit, but what is credit—and what makes it good or bad? To keep your credit healthy you need to know how it works, how to keep track of it, and how you can manage it. Credit refers to borrowing: your ability to borrow and the amount you borrow. When it comes to loans (like credit cards, auto loans, and home loans), your credit is your reputation as a borrower. It tells lenders how likely you are to repay your loans, which helps them decide whether or not to approve your loan request and how much to charge. Your credit is made up from information about your borrowing history. Most of the information comes from your credit reports. Your payment history—have you made late payments, or are you always on time? Your credit report is the master document that's behind your "credit." Based on that information, lenders decide whether or not to offer you a loan. However, most lenders don’t actually look at your credit report. Instead, a computer program goes through the information and creates a credit score (see below). A high score means you’re more likely to get approved for a loan at attractive rates. When somebody wants to see your credit report or get your credit score, they request it from a credit bureau (also known as credit reporting agencies). Under federal law, you are also allowed to view your credit reports for free at least once per year. See how to request your reports. Credit reporting agencies collect all of the information that appears in your credit report. They are information warehouses, but they might not keep as much data as you think. For example, your annual income is not part of your basic credit reports. Again, they get that information from lenders you've worked with, public records databases, and other sources. They distribute or sell that information when you apply for a loan, or when anybody requests a credit report (such as an employer or landlord—who needs your permission before a report can be released). There are numerous credit bureaus, but the "big three" have the greatest impact on what is most often referred to as your "credit." It's essential that the information in each credit bureau is accurate—if there are errors in your credit reports, they need to be fixed or you'll be rejected for loans (and it could cause problems in other areas such as job applications or auto insurance pricing). For more details, see How Credit Bureaus Work. Credit bureaus have a ton of information. There are hundreds or thousands of lines of information about you in their databases, and it’s difficult for lenders to sort through all of it. There are not enough hours in the day for an employee at a bank, credit union, or online lender to read through every loan applicant’s credit reports manually. As a result, most lenders use credit scores instead of reading credit reports. Credit scores are numbers generated by a computer program that reads through your credit reports. It looks for patterns, characteristics, and red flags in your history. Based on what the program finds, it spits out a credit score. Scores are easy for lenders to interpret—they might just set rules based on the level of your score. For example, credit scores above 720 might get approved automatically, loans between 650 and 720 get a higher interest rate, and other loans are not approved. While federal law gives you free credit reports, it does not provide for free credit scores. However, you can buy credit scores from credit bureaus, and there are several ways to see your score for free. Note that there are numerous credit scores out there—learn how they work and which ones are most important. What Is Credit Used For? Credit was originally used for lending decisions, but credit scores and reports show up in other areas of your life as well. Consumers and lawmakers constantly watch what credit is used for, and debate about the fairness of credit scoring and the expanding use of those scores. Borrowing money: this is the most common use of credit scores. Potential lenders want to know if you’re likely to repay your loans on time. Since they don’t know you personally, they try to make a prediction based on your previous loan experiences. A loan offered with no credit check is generally expensive. Insurance coverage: insurers check your credit to determine whether or not to cover you, and at what rates. They use insurance scores that are slightly different from standard lending scores. Employment: some employers check your credit, although you need to give them permission to do so. Presumably, they’re trying to make a judgment about how responsible you are based on your financial history. In some jobs, the link makes sense (they want to avoid situations where you might be tempted by bribes) while in other jobs the link is less clear. Utilities: to get services such as electricity or water, you might need to get a credit check. If that’s not possible (because you have not yet built up your credit) or you have bad credit, service providers often demand a larger security deposit. Renting: similar to utility companies, your next landlord might ask to pull your credit. Depending on the rental market, your credit could prevent you from renting or lead to a higher deposit. There is a lot of confusion around what is credit-related information. 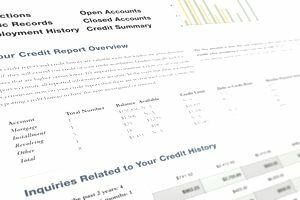 The most important information used in a credit decision is information from your credit reports and details that you include in an application. For example, your income is not included in your credit report or score, but lenders need to know whether or not you can afford to repay (by calculating a debt to income ratio, for example)—so they ask about income on the application. Read more about the factors that do and don’t affect your credit. How Is Credit Useful for Consumers? Credit can be helpful or harmful to consumers. To see the pros and cons, go back to the broader definition of credit: the ability to borrow. Borrowing makes it possible to buy expensive things. If you wanted to buy a house, you might need to set aside hundreds of thousands of dollars in a savings account, and that’s not feasible for most people. A mortgage loan makes it possible to own a home, control your living environment, and build equity in the home (if you’re lucky, the home’s value will increase as well). Auto loans make it possible to get a safe and reliable means of transportation. Student loans make it possible to afford higher education, which often leads to higher lifetime earnings and a better standard of living. With credit, consumers can pay for expensive things with small payments. Unfortunately, temptation (and sometimes just bad luck) can cause problems. Once you borrow, you need to repay. If you can’t afford the payments for whatever reason, your credit will suffer and you’ll face high expenses (late fees, legal costs, and so on). Tempting "0% interest" offers can end up being surprisingly expensive. Even if you always pay on time, credit can be a parasite on your finances. For example, payday loans are extremely expensive loans that often last for months or years. Paying only the minimum on your credit card also results in a long-term relationship with debt. It almost always costs money to borrow, and some people choose to live without debt and credit to avoid the costs and risks. What about credit scores? Those are probably helpful for consumers as a whole, but they are a problem if you’ve got bad credit. Credit scoring makes it less expensive to borrow because lenders can more or less automate lending decisions. What’s more, lenders don’t discriminate based on race or other characteristics of borrowers (credit scores are supposed to eliminate any discrimination), so lending is fairer. Finally, lenders can reduce their losses by avoiding borrowers that are more likely to default, which keeps costs down for other borrowers. The flip side, of course, is that if you have bad credit, you’ll have a hard time getting a loan. Fortunately, it is possible to build credit and rebuild it after you’ve fallen on hard times—and improvements can come within a few years. What do Credit Bureaus Do, and What do they Know About You? Information About My Credit for Free? Seriously? Have You Checked Your Credit Report Lately?